Pricing and specification | What Car? Trim levels are yet to be finalised, but expect all models to come with six airbags, climate control, and 18-inch alloy wheels. Options will include a panoramic sunroof, 19-inch alloy wheels, leather trim and touch-screen satellite-navigation. Regardless of specification, you're paying just 20,500 for a 2.0-litre car with a great deal of talent. 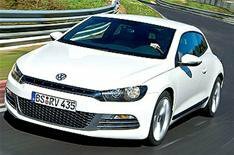 You can expect the Scirocco to put the wind up its rivals, which include the likes of Alfa Romeo's pretty Brera and even Audi's ultra-desirable TT, when it goes on sale in September.